Hospitals are failing dementia patients by not doing enough to prevent them becoming distressed or suffering harm, official figures show. Wards are often too noisy, unfamiliar and frightening, or cluttered with bedside tables and chairs which can cause serious falls. 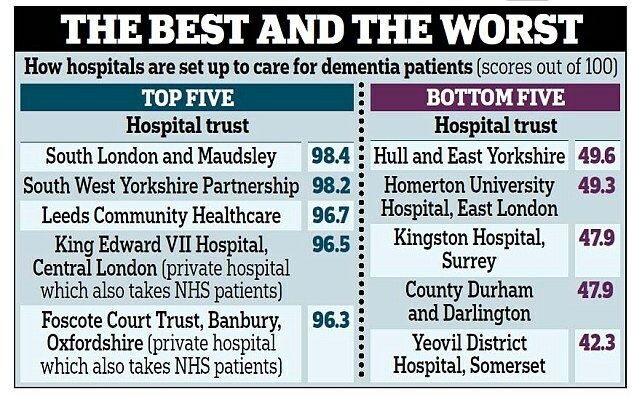 Figures published yesterday show that the worst hospital scored only 42 out of 100 in terms of how well it was set up to care for patients with dementia. Many had failed to install handrails to prevent falls or put up clear signs so patients did not get lost, and some were deemed to be too clinical and unwelcoming. Up to a quarter of patients in hospital have dementia. Many become extremely distressed when in such unfamiliar surroundings. Nurses recently warned that A&E units have become ‘places of terror’ for sufferers. Hospital managers were urged to make wards more ‘dementia-friendly’ under a strategy launched by David Cameron in 2012. Health bosses were told to take measures to prevent patients falling over or becoming distressed. The Daily Mail has long campaigned for an improvement in the care for patients with dementia as part of our Dignity for the Elderly campaign.